The In an effort to live longer for my daughter (I have to increase the number of years I have to embarrass her in front of her friends), I joined a gym. And then I didn't go. I mean I still might. I probably should, really. But it's cold. Or raining. Or means I have to go outside. Also, I did pay for the month. But in the meantime, Kijiji! 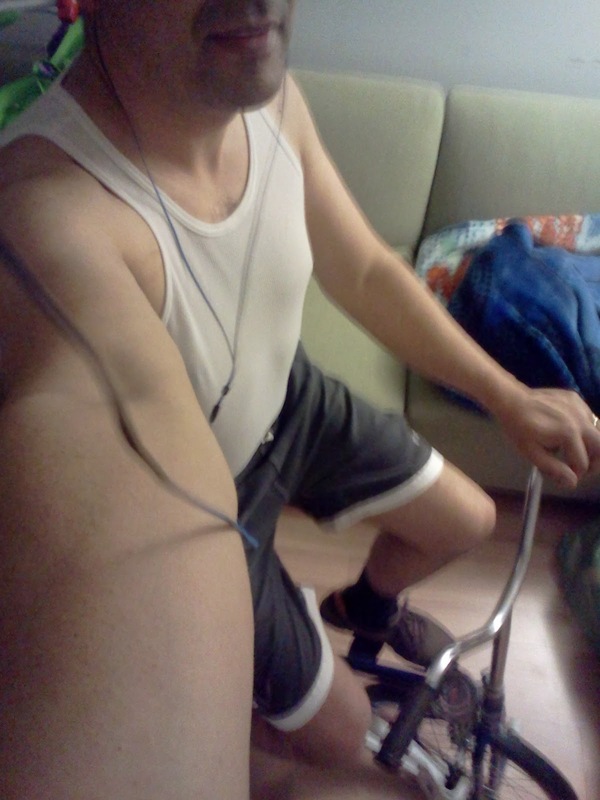 Found an exercise bike, an elliptical machine, and some other piece of equipment that's a weird combination sit-up/rowing simulator. Got two of the three pieces home in the Chorolla (need a van or truck for the elliptical). Got the bike set up in the basement right now. In fact, you could say that I have it set up and am riding it right now (because I am). The elliptical machine is going to have to wait until tomorrow. Feeling pretty good about this. It turns out that there comes a time in every man's life when he has to say that it's time to cut out the sugar and get the cholesterol down and maybe not be winded walking up the stairs. And my time was like 5 years ago, so I got some catching up to do. So going to do a little longer on the bike, kind of sweating a lot already, then take a shower, then hang out with My Lovely Wife before we both fall asleep. In the meantime, enjoy this picture of me testing out my new Dad Outfit! Yes, that's me wearing a wife beater, swimming trunks (cause I couldn't find my bike shorts), black socks and shoes on an exercise bike. I call this picture "Embarrassing Ruby in Public for the First Time". I'm rather proud of it.